O God, who filled Saint John of God with a spirit of compassion, grant, we pray, that, giving ourselves to works of charity, we may merit to be found among the elect in your Kingdom. Through our Lord Jesus Christ, your Son, who lives and reigns with you in the unity of the Holy Spirit, one God, for ever and ever. "God is love! Whoever abides in love; abides in God and God in him" (motto of St. John's community). 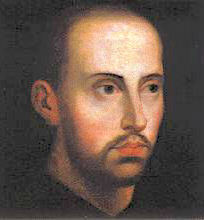 St. John of God, who was of Portuguese descent, was first a shepherd, a dealer and then a soldier. At the age of forty he was converted, and devoted himself to the care of those sick in mind, showing himself in this thankless task to be a true innovator and a saint of super-human heroism. He founded the Order of the Brothers Hospitallers, which bears his name. He died at Granada in 1550. Pope Leo XIII declared him patron of hospitals and of the sick and commanded his name to be placed in the Litanies of the Dying. In 1503, at the age of eight, John fled from his parents for some unknown reason. For a while he was a shepherd, then a book dealer. Matters spiritual were of no particular interest until he heard the preaching of Blessed John of Avila. Then his conversion was so sincere and sudden that he was considered to be out of his mind. He was incarcerated in the Royal Hospital in Granada, and suffered the cruel treatment of the day. Here he discovered how to show his love for God, through caring for those who were unable to respond to this cruel treatment. He resolved to devote the remainder of his life caring for people living on the margins of society. Following John’s death on his 55th birthday, March 8th, his helpers banded together to live in the same radical, spiritual way of Hospitality that John had exemplified and in 1572 they were approved by Pius V, as the Hospitaller Brothers of (St) John of God. The members bind themselves by a fourth vow, the service of the sick. Because of his work our saint has become the patron of hospitals and the dying. His name is in the Litany of the Dying. On July 3, 1549, a fire broke out in the kitchen of the Royal hospital at Granada that had been founded by the Spanish king and queen, Ferdinand and Isabella. It threatened to spread to the large wards where hundreds of sick were lying. The storm and fire bells rang loudly. People rushed from all sides, John in the lead. The fire was beyond control, firemen and volunteers were unable to extinguish it. No one dared to enter the burning building from which came the pitiful cries of the sick in the agony of imminent and certain death. Fire and smoke choked the exits. Those who could still arise from their beds stood pleading at the windows. The scene was enough to drive a person insane. Then he took an axe, climbed to the roof and began chopping away vigorously. Suddenly the liberated flames leapt up high beside him. He fled, only to continue his heroic work in another part of the building. There too a wave of fire soon stopped him. He was standing literally between two infernos. Moments passed, he was lost in the heat of the flames and the choking smoke. A quarter of an hour—loud cries of fear could be heard for the brave man—and then he sprang from the fire, blackened by smoke but unscathed except for singed eyebrows. Joyously the crowd surrounded him, congratulating the savior of the sick. John's modesty, however, prevented him from accepting praise and honors. Patron: Booksellers; heart patients; hospitals; nurses; the sick; the dying and firefighters. Symbols: The pomegranate—the fruit which represents charity and love, in the Bible, is the coat of arms of the Hospitaller Order and its motto is “God is Love”. John is depicted in art washing the feet of Jesus. A famous painting by Gomez-Moreno 1880 depicts John rescuing the patients from the inferno at the Royal Hospital (where he himself had been a patient 10 years earlier) where not even one life was lost. St. John of God followed his impulses when it came to serving Christ. He never reconsidered or second-guessed the inspirations of the Holy Spirit, but he acted on them instantly, whether or not they seemed practical. Today do not dissuade yourself from doing heroic little acts of charity, but follow God's will immediately as it is manifested to you. St. John of God never thought of himself but always reached out to others. Examine your conscience tonight and ask yourself: do I habitually give greater importance to others' needs before my own? Do I esteem myself over-highly, or do I consider myself of least importance? There is something lacking in present-day hospital methods that characterized the age-old practice of the Church, viz., a harmonious, organic relationship between liturgy and care of the sick. Pray the Litany of the Sick for those hospitalized. And pray that hospital care will incorporate the Christian dimension and respect each person as an image of God. Today's Station on the Coelian Hill was named after two brothers who were officers in the Roman Imperial court. Because they refused to renounce Christ, they were beheaded on June 26, 362. The basilica is where the Christian Senator Pammachius built over their home of the martyrs Sts. John and Paul. Near the church was a hospice where Pammachius dispensed his fortune in charity to the poor.